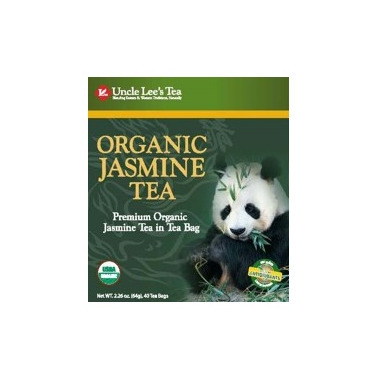 Uncle Lee's Organic Jasmine Tea is made from green tea leaves and fresh jasmine petals, when brewed, it produces a deep yellow color, fruity taste, and aroma of tropical flowers. Taste the Uncle Lee's difference! Hot Serving: Use one bag per cup, pour boiling water over tea bag. Brew for 3 to 5 minutes. Remove tea bag from cup. Add sweetener if desired. Cold Serving: Follow directions for Hot Serving, then slowly pour into a tall, ice- filled glass. Add a slice of orange or lemon. Chilled to desired icy temperature and serve.